President Trump instituted a policy in spring 2018 of family separation. The plan was to take families of undocumented immigrants apprehended at the US-Mexico border and send the parents to jails and their children to detention centers, often hundred or thousands of miles away from each other. The goal of such a cruel policy, which violates international law, was, as Trump’s Attorney General openly admitted, to dissuade refugees and other migrants from trying to enter the US. So far, it is unclear if the policy is working as Trump and his aides envision. Numbers of migrants apprehended at the border fluctuate mainly in response to factors that push Central Americans and others to try to flee their home countries: violence, hunger, political disorder and corruption. The journey from countries such as Honduras and El Salvador through Mexico, where they are targets for bandits, is perilous enough that only those who believe themselves to be in danger at home attempt the journey. The possibility of family separation if they make it to the US is one more cruelty added on to all the others of their migration. Trump and his administration so far have never bothered to see if their policies in any area are having the results they promise. Many of the policies are designed mainly as ostentatious gestures to their core supporters. Trump voters who hate non-white immigrants, and who were drawn to vote for Trump by his very thinly veiled racist statements about Mexicans, Africans, and other non-whites, haven’t shown that they want evidence of the policy’s success. Instead, the cruelty to families and the scenes of tearful and desperate parents and children is the point of the policy. They love Trump and family separation because it makes immigrants suffer, not because it might reduce immigration. The violence Central Americans are fleeing is in large part the result of past US actions. It is noteworthy that the migrants come from the three countries with governments endorsed or installed by the US—El Salvador, Guatemala and Honduras—while the other two countries, whose governments the US opposes—Nicaragua and Costa Rica—have sent almost no refugees north. Refugees are fleeing murderous gangs that are made up of former death squad members and soldiers who were recruited and paid by the US in past decades. The poverty that propels both the violence and the refugees is the end product of US economic and political dominance of those three countries. On June 26 a Federal judge ruled that the family separation was illegal and the Trump administration was ordered to reunite children with their parents. In many cases the parents already had been deported, often after they were told falsely that if they agreed to be deported that their children would be returned to them. 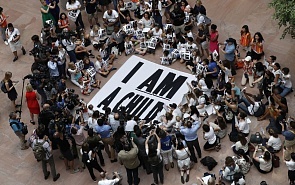 There remain several hundred children whose parents can’t be located or who are caught in the complex legal web of US immigration law and will wait for additional weeks or months to be reunited with their parents. The US is unique, for now, in having instituted a policy of family separation. This is one way in which Trump really is different in deed rather than just word, from past presidents. Yet, it would be a mistake to see this policy as coming from Trump alone. Attorney General Jeff Sessions is the official who conceived this policy, and he and other long-serving Republicans have spent years calling for even harsher measures to dissuade and expel immigrants. Trump is mainly the flamboyant figurehead of an approach to immigration that has the support of a majority of both Republican officeholders and voters. Other countries have pursued different but similarly harsh policies against immigrants. Most notably, Australia has an unbending policy of refusing to allow any undocumented immigrant entry to Australia. Instead, they are taken to camps in other countries where they are being held until they agree to return to their countries of origin. Conditions in the camps are brutal and the death rate is high. Australia’s policy is a success. Word has gotten around south Asia that it is impossible to make it to Australia. The number of refugees trying to reach Australia has declined to almost zero, even though potential refugees, above all the Rohingya of Myanmar, are fleeing dangers far worse than those of the Central Americans trying to come to the US. The most common tactic for reducing immigration is to pay other governments or armed gangs to intercept refugees before they reach the US or Europe. The US government, even under Obama, pressured and paid the Mexican state to harden its southern border and to arrest and deport Central Americans before they could get far enough north to reach the US border. German has given billions of dollars to Turkey to hold back Syrian and other refugees from entering the EU. Italy absorbed waves of refugees fleeing Africa by boat until the people who invented the Mafia finally figured out that they could stop the flow by bribing Libyan warlords to push back refugees from the coast. The refugees being held in Turkey are living in far better conditions than those trapped in Libya or those deported to Central America. Refugees don’t flow only from non-white to white countries. Argentines are angry about Bolivian refugees. South Africans have rioted and killed immigrants from Somali, Mozambique, and Zimbabwe. Côte d’Ivorians have attacked and killed immigrants form other West African countries, including some who have lived in Côte d’Ivoire their entire lives. The number of refugees and the intensity of anti-refugee policies almost certainly will grow in the coming years. Global warming will cause ever more and more severe droughts, floods, and crop failures, all of which will spawn environmental refugees. As governments collapse under the pressures of environmental disaster and neoliberalism, civil wars and anarchy will produce sets of refugees from violence. No country has proven willing to accept large numbers of refugees without sparking a political reaction. We can expect more Trumps and more cruel policies like family separation in the future.